The Supreme Court decision in the Janus case is being celebrated by the Trump Administration as a major setback for the US labor movement, one that will undermine the last bastion of strength for unions who still represent millions of workers in the public sector. However, this conservative attack not only exposes the Supreme Court’s pro-corporate bias, but also may serve as a wake-up call for unions and workers who are fed up with growing economic inequality and attacks by the Trump administration on workers, women, and people of color. While the 5-4 Supreme Court conservative majority claims to uphold the first amendment rights of workers, in fact this decision promotes corporate interests and attempts to silence the collective voice of workers through their unions. The timing of Janus is not an accident. For the first time in our history, the number of union members in the public sector is greater than in the private sector. Fully 30 percent of government and education workers are unionized versus only 6 percent of workers in private industries. The public sector is the last piece of our economy where family medical benefits, paid sick and vacation days, and pension plans are still the norm. The Janus decision threatens these benefits and could further undermine the country’s dwindling middle class. As the actions of the Trump Administration, the Republican-controlled Congress, and the conservative Supreme Court hurt the vast majority of working people, increasingly more Americans believe that corporate America is not working in their interests and are fighting back. Public sector unions are ideally positioned to link and gain strength from the broader social movements that are rising up to oppose the Trump Administration’s anti-immigrant policies, Muslim ban, opposition to women’s right to choose, and racially offensive rhetoric and actions. Public section unions represent large numbers of people of color and women, due in part to discriminatory practices in the private sector. The presidents of some of the largest public sector unions, such as the National Education Association, the American Federation of Teachers, and the Service Employees International Union, are all women. And all three women have been outspoken advocates for not only worker rights but also women’s rights, immigrant rights, and racial justice. The largest group of organized workers in the country are teachers and education workers, and their demand for quality public education has been front and center. In reaction to Education Secretary Betsy DeVos’s attempts to privatize public schools, teachers have organized actions in Virginia, West Virginia, Arizona, Oklahoma, and Colorado, all demanding better wages and working conditions as well as increased funding for public education. While Trump gives massive tax breaks to corporations and the wealthy elite, we have also witnessed successful campaigns to raise the minimum wage and to oppose wage theft, from California to New York. Unions led the fight for the $15 an hour minimum wage in Los Angeles and California, a victory that will benefit millions of low-wage workers. 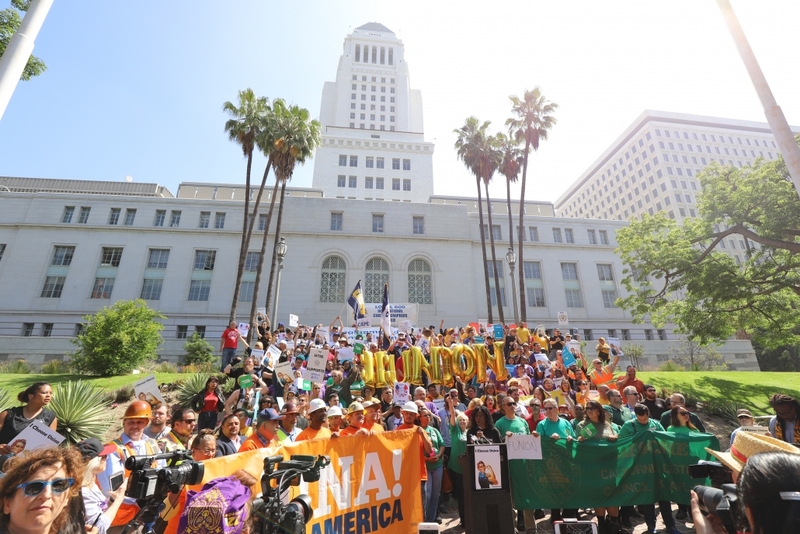 The Los Angeles labor movement has emerged as a focal point for the new American labor movement. Some of the most dynamic labor organizing campaigns in the country are happening in Los Angeles, and many are led by women, workers of color, and immigrants. For janitors, hotel, home care, and car wash workers, unions have inspired a new generation of activism and built powerful alliances between unions, community organizations, students, and people of faith. The renewed spirit of organizing in Los Angeles is building on a strong labor history tradition that began long before there were legal protections for unions. Without labor laws to protect them, unions fought for the eight-hour day, worker’s compensation, social security benefits, unemployment insurance, pensions, and health and safety regulations. Unions fought for and built the middle class, which is now being threatened by corporate policies to reward the wealthy elite and undermine the interests of millions of working poor. Undoubtedly, it is a challenging time for unions across our nation, but we can take lessons from the LA organizing playbook to organize new and existing workers. We can continue to expand diverse coalitions of working people who embrace worker rights, immigrant rights, gender equality, and unionism. And with the November 2018 elections around the corner, voters will have an opportunity to challenge Trump’s campaign to “Make America Great Again” for the corporate elite. “Union Members Survey,” Bureau of Labor Statistics, January 19, 2018, https://www.bls.gov/news.release/union2.nr0.htm.